In early March, funded by the Research Unit for Indigenous Language (RUIL) Indigenous Scholar Scheme, Indigenous researchers Makinti Minutjukur, Katrina Tjitayi and Umatji Tjitayi visited Melbourne to present at the 2018 Australian Languages Workshop (ALW) with RUIL postdoctoral researcher Rebecca Defina. 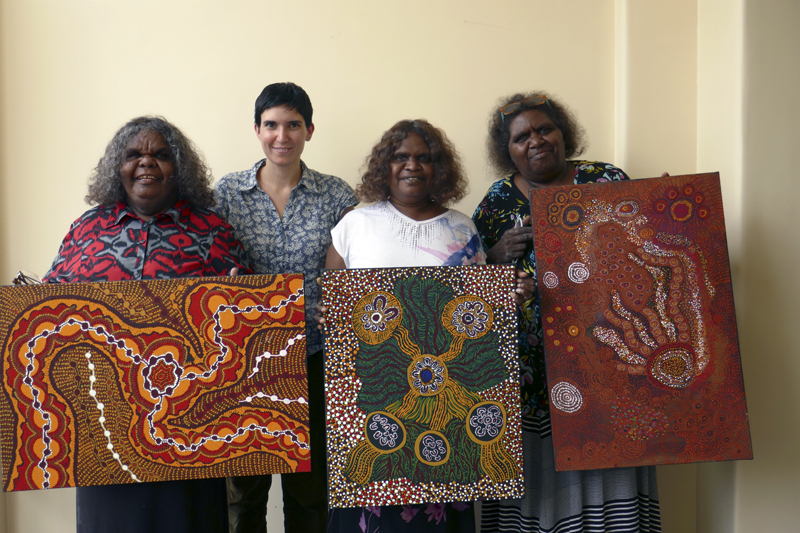 The four researchers have been working together on a joint project investigating recent changes in the Pitjantjatjara language as spoken in Pukatja (Ernabella). Makinti, Katrina and Umatji are celebrated educators and artists currently working with the Pitjantjatjara Yankunytjatjara Education Committee. They have been increasingly concerned by changes they have observed in how people are speaking Pitjantjatjara and enthusiastically joined Rebecca Defina in a collaborative effort to document these changes. Makinti, Katrina and Umatji were all highly engaged by ALW. They attended most presentations and took a lot away from them. Katrina was particularly interested in the talks on hand signs and made pages of notes comparing Western Desert signs she knew with others being discussed in the talks. They were all fascinated by Kriol and we had many lengthy discussions about its status as a language and relationship to other languages. The trip broadened Makinti, Katrina, and Umatji’s ideas of what is possible in language work and gave them new connections to help them implement these new ideas in the APY communities. On the first day of the workshop between talks, Makinti, Katrina and Umatji created three incredible artworks depicting the relationship of language with members of their family and the broader community. These paintings are now in pride of place on level 3 at the School of Languages and Linguistics, and will soon be accompanied by the story belonging to each painting and a bio of the artist.